The bat is built for a value purchase in the single piece aluminum space for players who want that hot out of the wrapper feel on a light swinging single piece aluminum bat. From our view, it is easily recommendable. 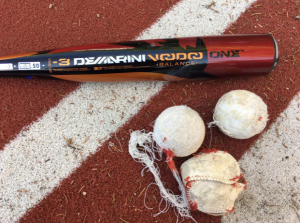 In more detail below are our 2018 DeMarini Voodoo One reviews and recommendation… Jump to the full review. We aren’t the only ones to have information about the Voodoo One. Other places, in particular those who sell bats, usually have a boiler plate write up on the specs of a bat. Many of those we reference to make sure we are seeing what we should be. Here are some more references for the 2018 DeMarini Voodoo One review. The bat is built for a value purchase in the single piece aluminum space for players who want that hot out of the wrapper feel on a light swinging single piece aluminum bat. From our view, it is easily recommendable. In more detail below are our 2018 DeMarini Voodoo One reviews and recommendations. We recommend the 2018 Voodoo One for the all fields hitter with occasional power who likes a light swing and the hot out of the wrapper feel of a single piece aluminum. Its distinguishing feature, when compared to most other bats on the market, is the stiff feel of a single piece bat. The bat swings more akin to wood than two piece bats. After much hitting of the Voodoo One, we think it a decent option for the value USABat space. It lacked the feel and barrel size we like on more expensive bats. No specific technology to dampen the sting really made smaller players shy away. But, for stronger hitters that don’t mind hand sting, or a good BP type bat for cold weather, the 2018 DeMarini Voodoo One USABat might be the perfect fit. In terms of barrel size it leaves at least a bit to be desired. But it’s price point, and single piece design, put the barrel size, swing weight and barrel size in the same categories of other similar bats. The bat is a great game bat for the hitter described above. But, it is also a great game bat for the player willing to move into the realm of big boy single piece wood and aluminum bats. It could be considered, if you will, the gateway drug for a player looking to ultimately use wood. The biggest upgrade to the line of the 2018 Voodoo One Balanced is the addition of sizes. As in 2017, the bat will come in a drop 10 2 3/4 as well as a BBCOR. For 2018, expect an additional drop 10 in the 2 5/8 space as well as an iteration in the new USAbat makeup. In terms of overall performance, barrel size and swing weight, there are no considerable differences between the 2018 and 2017 models. The 2017 model, especially in the BBCOR space, was a rock star of a bat. The vast majority of individual reviews, including our own review, were glowing. For the right type of hitter the 2017 Voodoo One Balanced was a perfect fit. We expect it to be no different for the 2018 model. In terms of a single piece aluminum bat the world is your oyster. There are literally dozens of cheap and not so cheap single piece bats on the market today. If you narrow those down by ones claiming to be in the performance space and those that have a light swing weight, the list gets much smaller. One bat that still fits the bill is the 2018 Louisville Slugger 517 Omaha. It, like the Voodoo One, comes in a number of sizes and focuses on a lighter swing within a single piece aluminum bat. There are other similarly priced single piece aluminum bats. Those, like the Rawlings VELO and Marucci CAT 7, also use some variable wall thickness and unique tech in the handle or knob to be different enough that we would keep them off the comparable list. The Voodoo One in the USABat space, much like its BBCOR version, is a straight forward aluminum single piece bat. DeMarini makes not audacious claims about the inner workings of their barrel on this bat. They use a high grade aluminum barrel that is the same one they use on the more expensive hybrid Voodoo bat. The most innovative piece found on the Voodoo One is the end cap. The end cap uses three pieces fused together to help increase durability and control swing weight. But, make no mistake, it is ultimately an end cap—and it’s hard to get too excited about that. There are atleast a few single piece bats in the drop 10 space within the USABat standard. Most notably, and likely most comparable swing to the DeMarini Voodoo One USABat is the Rawlings VELO drop 10. Both bats are single piece aluminums, have a light swing weight and in run a similar price point. Rawlings’ does use an extended composite end cap and technically has a lighter swing weight, but they are close. Neither bat has a remarkable barrel size and the hand sting on both is to be remembered. But, in terms of a single piece aluminum meant to take a beating and at least put you in the performance category of bats, the Voodoo One and Rawlings VELO are spot on. As a single piece aluminum bat there are not many unqiue changes a company can make. (Ahem, says the Rawlings VELO). DeMarini’s Voodoo One is a light swinging single piece aluminum bat built with a large barrel and stiff feel in mind. DeMarini refers to this alumimnum as a X14 alloy. It is the same material used in the 2017 bat. The alloy is a reference to an aluminum with different additives. Those additives are often proprietary to the companies that make them and are used to create a more durable bat without sacrificing swing weight and barrel size. Below is the list of sizes the 2018 DeMarini Voodoo One balanced will be offered in. The 2 5/8 drop 10 as well as the USAbat are new to the 2018 line.